...perfectly describes Portuguese born Paulo Caetano. 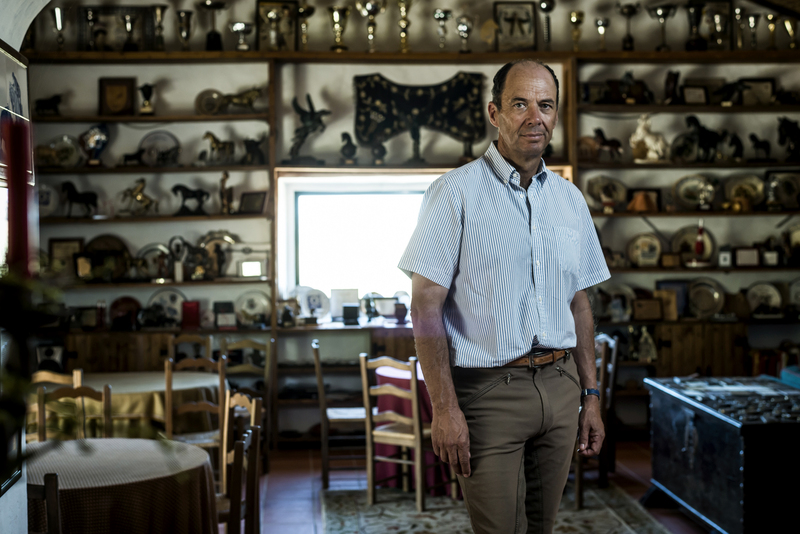 A remarkable horseman who lives in Portugal on one of his stunning farms in the Alentejo region. 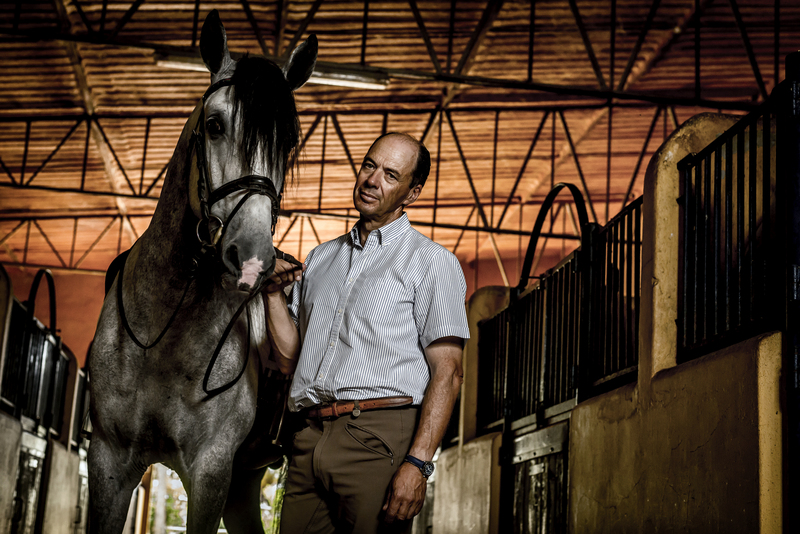 He breeds and trains Lusitano horses, rears cattle and teaches dressage riders. Paulo has a fascinating equestrian story that began as a boy. In contrast to his father, a businessman in Lisbon, Paulo’s passion lay with horses - in particular the Lusitano breed and bullfighting. Nowadays a controversial subject but in the 70’s one of Portugal’s most important sports with bullfighters sharing a similar status to that of the top footballers today. Paulo begun at 12 years and had his first official fight at 14 years old. He proved to be talented and became one of Portugal’s top fighters. Bullfighters that fight from the back of a horse are trained in many classical techniques especially to ride with the tiniest most subtle weight aids. The basis of the classical seat. Paulo’s early equestrian education was classical. He was extremely fortunate to know some of the greatest modern classical masters such as the Master João Branco Nuncio and Master Nuno de Oliveira - two of the most important classical Equestrian icons in Portugal and in fact worldwide. During the Portuguese revolution in the early 70’s, he trained for several years with The Viscount da Córte and his student João Parreira Cano in classical principles. Since then Paulo has had many other inspirational trainers, he’s always looking to know more believing we can learn something from everything in life. Nowadays he is very activity involved in International dressage competition and teaching his students. I asked him to tell me more about his thoughts on achieving a balance between classical and modern dressage. The most vital classical aspects are the importance of beauty, lightness and harmony. “It seems to me riders globally are looking more closely at the roots of classical equitation. Since I am Portuguese and was a bullfighter classical equitation is in my heart, so I believe it is fundamental to understand the history of the Lusitano (Iberian) horse and how Portuguese equitation evolved. The Iberian horses are very important in our history. Their functionality made them versatile companions, in fact they influenced the history of our civilisation. Beginning as great war horses they had amazing combat skills with their agility and ability for collection they could produce powerful and dangerous battle movements such as the capriole - designed to knock out the enemy coming up behind. After the war classical equitation grew from the skills developed in combat. If you assimilate the classical equitation doctrine practised since the “Haute Renaissance” in the riding academies of Saumur (France), Belém (Portugal), Vienna (Austria) and Jerez ( España) you will see the principles. I think it’s also very valuable to understand the influence of the German masters too, they were making the connection between the gymnastic of the horse and the importance of the development of the horse’s body and mind following a intelligent structured method. They introduced the principle of the training scales. I believe the training scales act as the bridge between classical and modern. Although in both professional dressage training or classical show training have some very different requirements, different things to achieve, the basics don’t change. In sport you have to follow a strict development program to build the physical capacities of your horse. It is very important to respect and understand his limits in order to help him achieve the best he can. The sport horse is not a pet. It is an athlete and you must be responsible for his improvement and to stay healthy. To achieve the goal, you must have a very good eye, to have the capacity to anticipate reactions, the discipline to follow the right way but, mainly, to know what the right way is. At only 18 years old Giovana will ride Zingaro, a bay Lusitano by Guizo. Nowadays Paulo is excelling as a dressage trainer and amongst many other prominent riders he instructs his talented daughter Maria Caetano. Maria is one of the few Portuguese women competing internationally and was in the World Equestrian games in 2013 she has various other major international competitions under her belt. Maria will be competing at the end of July in Holland in the International Longines Breeding Young Horse Championships on Fenix de Tineo. In her team she has several extremely talented young horses capable of achieving International level, so her competition future is looking very bright. With the Rio Olympics on the verge of lift off, Paulo has every reason to be proud. In the Brazilian dressage team there will be two Lusitano horses who have been partly trained by Paulo and Maria - Vendaval and Zingaro plus his young student Giovana Pass will ride. Guizo was the first ever Lusitano to be on the podium in the Olympics - winning a silver in the Spanish team event in Athens. It was while Giovana was in Portugal training that Paulo decided she should try Zingaro. He had a feeling they would fit well together. He was right, Paulo told me that in his view they make a perfect match. In the Olympic tests they were the highest scoring pair. I asked Paulo how he manages to train Giovana so far apart, he told me he travels to Brazil once a month and the rest of the sessions are carried out live on Skype. Vendaval is the other Lusitano horse in the Brazilian team and was trained for just over one year with Paulo and Maria I asked him how did he come to be with him? Vendaval came from dressage rider and trainer Johan Zaggers but he was originally started and competed in Portugal. Zaggers challenged Maria to take Vendaval to GP level. Maria loved Vendaval so the challenge was accepted. A year on Maria was competing him in GP. Soon after this Olympic rider Luiza Tavares de Almeida came to see him. Paulo told me “ I could see in her eyes that she had just found her horse for Rio”. “Maria and I are really proud and happy to see these two fantastic Lusitanos with two such talented Olympic riders in their saddles. I am particularly proud of Giovana and wish her every success”. Let’s hope that the next Olympics sees Maria in the saddle. The sport horse is not a pet. It is an athlete and you must be responsible for his improvement.